The first two sea turtle patients. 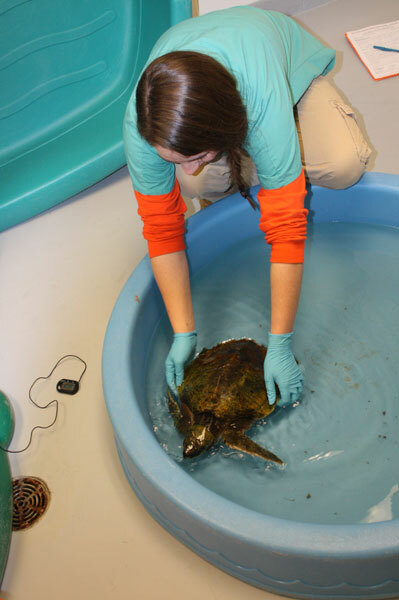 Each turtle will be receiving some physical therapy in the form of a supervised swim as seen in the images attached. 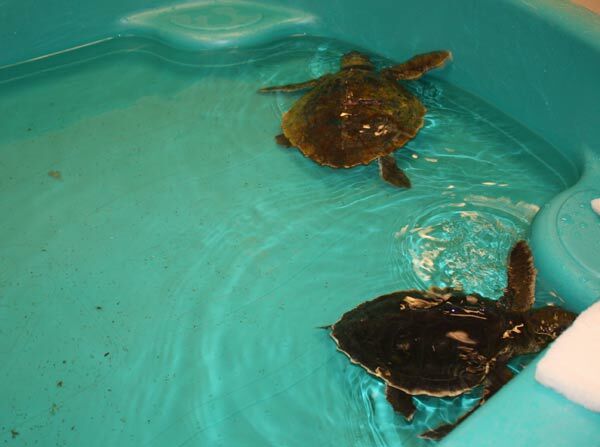 These two, juvenile Kemp’s ridley sea turtles are being slowly re-warmed about five degrees per day at the New England Aquarium’s Animal Care Center in Quincy. The 3 and 5 pound sea turtles were found in Dennis and Brewster with body temperatures of 55.7 and 58.6, close to the water temperature of eastern Cape Cod Bay. Humans would be long dead with that low a body temperature, but sea turtles are cold-blooded and with medical intervention can even survive body temperatures in the low 40’s. The black shelled turtles will have their body temperatures increased just five degrees per day for four days until their body temperatures are in the mid-70’s. This slow re-warming strategy helps the turtles fight off infections. Samantha MacEwan a volunteer with the New England Aquarium guides the short swim of a hypothermic sea turtles that had stranded just a day before. Kemp’s ridley sea turtles are the most endangered sea turtle in the world, and each summer hundreds of them migrate to the Cape to feed on crabs. However, each autumn, anywhere from 25 to 200 of these sea turtles will fail to migrate back south due to the difficulty of navigating out of Cape Cod Bay, which has land on three sides except to the north. For two decades the Mass Audubon Sanctuary at Wellfleet Bay has been rescuing these turtles on Cape Cod Bay and bringing them to the Aquarium for months long treatment and eventual release in warmer waters down south. (Here's a great video of a sea turtle release.) This partnership has resulted in the release of nearly one thousand of the world’s most endangered sea turtles in a population that numbers in just the low tens of thousands. This program has made a tangible difference in the recovery of the population of the world’s most endangered sea turtle. Dedicated Mass Audubon volunteers and staff are walking Cape Cod beaches Thursday morning searching for sea turtles that may strand with the significant wave activity caused by the Nor’easter. More turtles are expected. To get an idea of the work ahead during the cold-stun season, look back on the sea turtle posts from 2011, 2010, 2009 and 2008. Learn how rescued sea turtles are treated with lasers. Check out these awesome pictures of a sea turtle release. Did you know other turtles take private airplanes to warmer climates? See how we make the turtles comfy while they're in rehab, how and what they eat and how they get their names.